Senior Dylan Osetkowski came up huge for Texas in a 73-63 win over visiting No. 11 Kansas Tuesday at the Frank Erwin Center (photo by Jose Mendez/Horns Illustrated). AUSTIN, Texas — When his players were 15 minutes late to shootaround today, Texas men’s basketball coach Shaka Smart felt more confident than ever about his team. Heading into a huge home showdown with No. 11 Kansas, the Longhorns called a players-only meeting that wound up running a bit long, but led to a renewed fire and consistency. 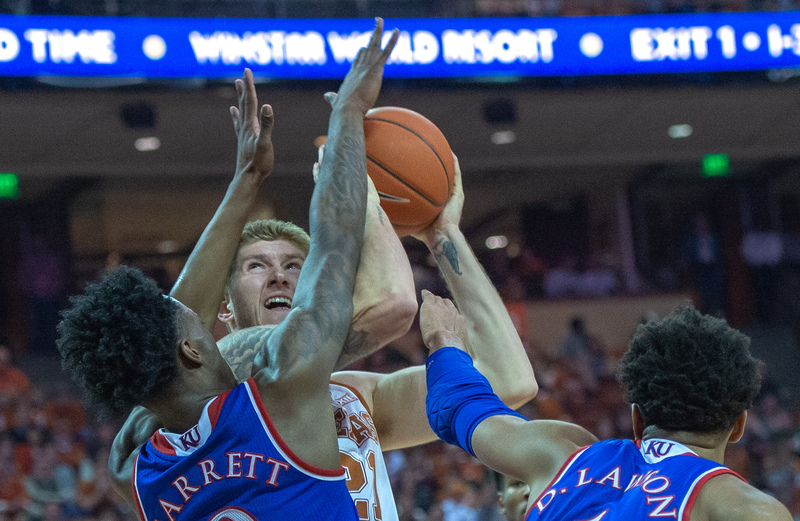 Texas then toppled the Jayhawks 73-63 Tuesday night at the Frank Erwin Center. Seniors Dylan Osetkowski and Kerwin “Snoop” Roach II paced the 'Horns (12-9 overall, 4-4 in Big 12 Conference games) to the upset victory, while Jase Febres nailed a few huge three-pointers and Jaxson Hayes kept Kansas (16-5, 5-3 against Big 12 teams) off-balance under the basket. Osetkowski finished with 16 points while Roach had 15, including 6-of-7 free-throw shooting down the stretch, allowing Texas to control the clock to secure the win.